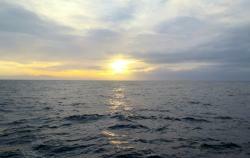 Sunrise over the Southern Ocean. Photo by Jillian Worssam. This project focuses on an important group of photosynthetic algae in the Southern Ocean (SO), diatoms, and the roles associated bacterial communities play in modulating their growth. Diatom growth fuels the food web in the SO and balances atmospheric carbon dioxide by sequestering the carbon used for growth to the deep ocean on long time scales as cells sink below the surface. The diatom growth is limited by the available iron in the seawater, most of which is not freely available to the diatoms but instead is tightly bound to other compounds. The nature of these compounds and how phytoplankton acquire iron from them is critical to understanding productivity in this region and globally. The investigators will conduct experiments to characterize the relationship between diatoms, their associated bacteria, and iron in open ocean and inshore waters. Experiments will involve supplying nutrients at varying nutrient ratios to natural phytoplankton assemblages to determine how diatoms and their associated bacteria respond to different conditions. This will provide valuable data that can be used by climate and food web modelers and it will help us better understand the relationship between iron, a key nutrient in the ocean, and the organisms at the base of the food web that use iron for photosynthetic growth and carbon uptake. Teacher Spotlight on Cara Pekarcik, 2018 Massachusetts Teacher of the Year in the publication Museum Institute for Teaching Science. Chlorophyll Conundrum: Can factors affect chlorophyll levels in plankton samples? Podcast of the live TV interview with QATV journalist Joe Catalano. 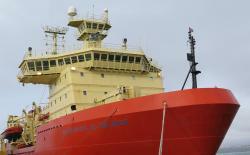 This interview is a follow-up to a previous discussion about the PolarTREC expedition. Teacher Cara Pekarcik and researcher Dr. Bethany Jenkins discuss the science behind the expedition "Southern Ocean Diatoms" while aboard the Nathaniel B. Palmer in the Southern Ocean near Antarctica. Press release from the University of Rhode Island highlighting the work of Dr. Bethany Jenkins and the Southern Ocean Diatom expedition. AM Quincy television interview with Quincy Access Television broadcast anchor Joe Catalano. This interview is a follow-up to the August 8th interview on the Currently in Quincy program. PolarTREC teacher Cara Pekarcik discusses her upcoming expedition and plans for community outreach. Podcast of the Currently in Quincy interview related to PolarTREC. Cara Pekarcik sat down with Joe Catalano from Quincy Access Television to discuss her upcoming trip to Antarctica. The conversation touches on the specific research and the outreach component of the trip. Newspaper article related to outreach at the Mystic Aquarium Women in Science Day. URI researchers and PolarTREC teacher Cara Pekarcik were interviewed about their upcoming research trip to Antarctica. Cara at Mystic Aquarium Women in Science Day talking to a student. Cara Pekarcik received her Bachelor of Science in Psychobiology from Southampton College of Long Island University in 2001. Upon graduation, Cara began working as a staff scientist at The Whale Center of New England, a non-profit research organization in Gloucester, MA, where she studied demographics and behavior of large whales (specifically humpback whales, Megaptera novaeangliae). Cara’s responsibilities also included the role of educator/naturalist onboard thousands of whale watches. Her enthusiasm for this aspect of the job steered her towards a career as a high school science teacher and in 2006 Cara began teaching at North Quincy High School (NQHS) in Quincy, MA. She received her Masters in Secondary Education (Biology) from UMass Boston in 2011. She brings her field experience to the various levels of general biology, physical science, marine science, and zoology she teaches, including incorporating an annual whale watch into her curriculum and conducting a seal necropsy with her students. She also coaches volleyball and serves as the school adviser for the National Honor Society Chapter at NQHS. In her time away from work, Cara loves to read, kayak, travel (especially to National Parks), spend time with family and friends, and explore the outdoors. I am a marine microbial ecologist that uses a combination of laboratory and field measurements to understand how phytoplankton in the ocean function in present and predicted future oceans. Phytoplankton are single-celled algae that live in the surface ocean and take up carbon dioxide and convert it to oxygen via photosynthesis. My research team specifically focuses on diatoms, a group of phytoplankton that build shells out of silicon, generate about 1/4 of the oxygen we breathe and are very important in the Southern Ocean ecosystem. My love of science started as a grade school student in Elmhurst, IL. I am the product of good public schools for my entire K-12 education. I was a biochemistry major at Mount Holyoke College in MA for my undergraduate degree. Following this, I was a high school science teacher for two years at Pomfret School, an independent boarding School in CT. I went on to earn my PhD in Chemistry from the University of Oregon and conducted postdoctoral research at UC Santa Cruz. I have been in my current position as a faculty member at the University of Rhode Island for 10 years. Dr. P. Dreux Chappell is a marine microbial ecologist and an assistant professor at Old Dominion University that uses interdisciplinary approaches to study the interplay between phytoplankton dynamics and ocean chemistry. An overarching theme that connects her research is: what forms of nutrients are biologically available to ocean phytoplankton, some of the most important primary producers on the planet? She use a suite of molecular biological tools and analysis of trace metal and macronutrient concentrations in seawater to link biological activity and chemical distributions in controlled laboratory settings and in the field. She uses these tools to answer broad questions about the environmental factors that control phytoplankton distributions and productivity. She has a B.A. in Biology from Amherst College, spent a semester of college in Woods Hole studying environmental science at the Marine Biological Laboratory while attending Amherst, and has a Ph.D. from the Massachusetts Institute of Technology-Woods Hole Oceanographic Institution Joint Program in Chemical Oceanography. Kristen Buck is an Assistant Professor in the College of Marine Science at the University of South Florida. Her primary research interests are focused on the biogeochemical cycling of trace metals and nutrients in the marine environment. In particular, research in the Buck lab examine the predominant chemical forms (or speciation) of trace metals in seawater, implications of this speciation for metal bioavailability, and feedbacks between natural biological communities and seawater chemistry.